Buy 6-11 Two Little Fishies Adhesives and receive a 5% discount. A cyanoacrylate gel type instant adhesive. Excellent for gluing stony coral fragments to coral rock and other surfaces. No messy mixing of 2-part epoxy putties, or concern with irritation to tank inhabitants from leaching amine epoxy curing agents. Highest purity cyanacrylate adhesive available (not diluted with low-cost resins). The Instant Ocean HoldFast epoxy stick has superior bonding ability that allows you to create steps, caves, cliffs, and walls for aquarium animals to enjoy. It bonds all types of materials from rocks, to corals, to slate, and many more. The Instant Ocean HoldFast epoxy stick is non-toxic to fish and invertebrates and is great for use in freshwater or saltwater. HoldFast epoxy stick mixes easily in the palm of your hand. No messy liquids to measure and mix — just break off a piece, knead it in your hand until it turns white, and it is ready to bond. The Maxspect Coral Glue Gun is a unique corrosion free device that dispenses an extra thick consistency gel that is perfect for heavier frags that you need to stand vertical. Dispense what is needed and never have to worry about the glue drying up again. Keep you hands and work area clean. The included 50g tube of glue is cyanoacrylate, which is widely used for mounting coral frags to plugs, rocks, and whatever you may need to attach them to. Comes with long reaching stainless steel applicators for hard to reach places. Works under water. 50g tube for the Maxspect Coral Glue Gun. This product can only be used with the Maxspect Coral Glue Gun. Seachem Flourish Glue is a superior cyanoacrylate gel for attaching moss and plants to rocks, driftwood, and even gravel. It's uniquely useful when planting bunch plants. Simply apply Flourish Glue, plant as usual and the plants stay rooted in the substrate. It bonds within seconds and has excellent control, hold and durability characteristics. It can even be used underwater. Flourish Glue can be used for any aquascaping in freshwater or saltwater aquariums or for any plastics repairs. Flourish Glue comes in an aluminum tube for extended stability beyond products contained in plastic bottles. It won't dry up in the tube. Two 4 gram tubes included. Seachem Reef Glue, 20 grams, is a superior cyanoacrylate gel for gluing and mounting coral frags and colonies to reef rock or plugs. It bonds within seconds and has excellent control, hold and durability characteristics. It can even be used underwater. Reef Glue can be used for any aquascaping in freshwater or saltwater aquariums or for any plastics repairs. Reef Glue is in an aluminum tube for extended stability life beyond products contained in plastic bottles—it won't dry up in the tube. 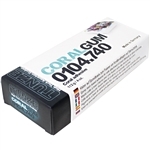 Tunze Coral Gum 0104.740 is an epoxy resin based adhesive for safe attachment of coral offshoots on stone substrates. Dyed red, similar to calcareous algae, suitable especially for coral reef aquariums. It is also suitable for attaching glass, ceramic, wood and many plastics. Contents: 112 grams (4 oz.). Instructions For Use. 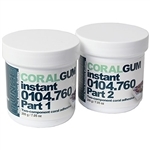 Tunze Coral Gum Instant 104.76 is a two-component coral adhesive for the safe cementing of coral fragments to stone substrates. No deleterious matter or adhesive residue is introduced into the aquarium water; it is unbreakable, yet remains flexible and withstands high loads. Can be used in freshwater and marine aquariums. Contents: 2 x 200 grams (14.11oz.). Instructions For Use. Tunze Coral Gum Instant (0104.750) is a two-component coral adhesive for the safe cementing of coral fragments to stone substrates. No deleterious matter or adhesive residue is introduced into the aquarium water; it is unbreakable, yet remains flexible and withstands high loads. Can be used in all aquariums. Size: 120 Grams. Instructions For Use. AquaStik Red Coralline. Underwater Epoxy Putty for marine aquariums and reef aquariums. Color matches coralline algae and live rock. Excellent for securing rock, stony corals, gorgonians and aquatic plants. Non-toxic to fish, plants & small animals. Cures dry, damp, or underwater. AquaStik Stone Grey. Underwater Epoxy Putty for marine aquariums and reef aquariums. Excellent for securing rock, stony corals, gorgonians and aquatic plants. Non-toxic to fish, plants & small animals. Cures dry, damp, or underwater. CorAffix Gel is an ethyl cyanoacrylate bonding compound with a thick gel consistency. It is very easy to use for attaching frags of stony corals, zoanthids, and some soft corals to plugs or bases. Available in a 20 gram tube with easy to use, re-sealing tip.